We know your business. More importantly, we understand today’s car buyers. Our unique customer-centric marketing approach sells trust and transparency for your dealership—and that, in turn, sells cars. Vision Media has been a leader in Automotive advertising since 2003 and was among the first to enter the digital space. With independent retail automotive clients and DAA/LMA groups across the Country, our advertising consistently generates qualified prospects at a lower cost per lead and builds brand loyalty—across every medium. With individual vendors for production, placement, email, web, online search and social media—some dealers spend as much time managing their vendors as they do their advertising. 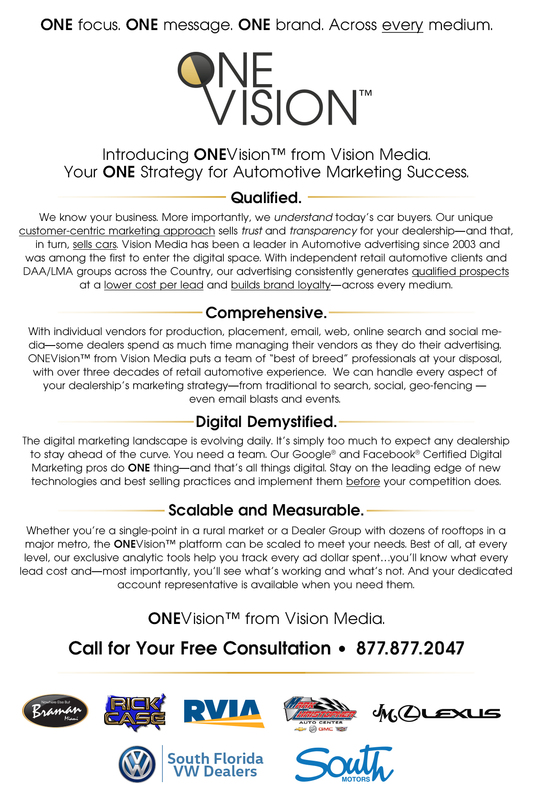 ONEVision™ from Vision Media puts a team of “best of breed” professionals at your disposal, with over three decades of retail automotive experience. We can handle every aspect of your dealership’s marketing strategy—from traditional to search, social, geo-fencing — even email blasts and events. The digital marketing landscape is evolving daily. It’s simply too much to expect any dealership to stay ahead of the curve. You need a team. Our Google® and Facebook® Certified Digital Marketing pros do ONE thing—and that’s all things digital. Stay on the leading edge of new technologies and best selling practices and implement them before your competition does. Whether you’re a single-point in a rural market or a Dealer Group with dozens of rooftops in a major metro, the ONEVision™ platform can be scaled to meet your needs. Best of all, at every level, our exclusive analytic tools help you track every ad dollar spent…you’ll know what every lead cost and—most importantly, you’ll see what’s working and what’s not. And your dedicated account representative is available when you need them.